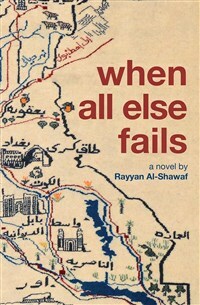 Rayyan Al-Shawaf is a book critic whose reviews and essays have appeared in the Boston Globe, Chicago Tribune, Christian Science Monitor, Globe and Mail, LARB, Los Angeles Times, Miami Herald, Minneapolis Star Tribune, Philadelphia Inquirer, San Antonio Express-News, San Francisco Chronicle, Toronto Star, Truthdig, Washington Post, and other publications. He lives in Lebanon, in a mountain village overlooking Beirut. When All Else Fails is his first novel.